For three years during the early ’90s, Sega began a massive transformation into a major player in the gaming industry, thanks to the success of a little blue hedgehog. In 1991, the game maker turned its gaze to Europe and launched a major campaign to make the Mega Drive the dominant console on the continent. With a buyout of Virgin Mastertronic, which had merged in 1988, Sega Europe Ltd. was born. Former Virgin head Nick Alexander took the reigns as CEO, and he remained with the company until 1994. During Alexander’s tenure, SOE expanded and the Mega Drive achieved marked success across Europe. Sega-16 recently had the chance to speak with Mr. Alexander about his time at Sega. Sega-16: When you took over at Sega of Europe, what was the situation there like? Nick Alexander: I joined Virgin from Thorn EMI Video Programmes, where I was International Marketing Manager for Home Computer Software, in 1983 to set up Virgin Games, Virgin’s first computer game publishing business of which I was Managing Director. I was twenty-seven at the time. We were sold by Virgin to Sega so the company that was Virgin Mastertronic became Sega Europe. My job title and boss changed but otherwise things stayed the same. Sega-16: Mastertronic was Sega’s major distributor in England, Germany, and France, which helped the Master System greatly. Was this the reason why Sega bought the company in 1991? Nick Alexander: In 1987 we bought a minority stake in Mastertronic. They needed to raise some cash to pay for the LCs for their first order of Master Systems and we wanted to be in the budget computer game business, which Mastertronic dominated. Sega delivered the shipment too late for Christmas so retailers cancelled their orders, and Mastertronic was tipped into a cash crisis which was resolved by our acquiring the rest of Mastertronic and merging it with Virgin Games to become Virgin Mastertronic, of which I was again Managing Director. Sega had done the same thing to their other European distributors pushing the French one into financial crisis and the German one, part of Bertelsmann, to decide they did not want to work with Sega anymore. Sega asked us if we would take on these two territories as well, and as by now Nintendo’s first successful Christmas in the U.S. was clear, we agreed and did so from mid ’88. As Virgin we decided to market the Master System at an older, cooler, teenage user. Nintendo’s marketing was aimed more at a family audience with pre-teen kids. Sega-16: The market in Europe is much different than that of the U.S., and each country is almost like its own territory, with hardware and software experiencing different levels of success in each one. How challenging was it for Sega to broaden the appeal of the Mega Drive throughout Europe? Nick Alexander: That was probably the most important decision that we took. When the Genesis launched in the U.S., they decided to take the same route, and I believe that was why they drew ahead of a very well established Nintendo in the 16-bit war. It was also how Sony positioned the Playstation when it eventually emerged. We had one marketing strategy for all Europe but execution varied by territory. Overtime we increasingly centralised our ads and materials. We added Spain in 1990, and in 1991 Sega decided that it would like to have control of their European distribution and they bought the sales, marketing and distribution parts of our business, which I went to run as CEO of Sega Europe. The deal made sense from all points of view. As a third party distributor, it made no sense for Virgin to invest in marketing or product to the extent that Sega Japan (SOJ) wanted. The degree of competitive price pressure also meant that the margins were increasingly unattractive for Virgin. Sega-16: Nintendo had varying degrees of success in Europe, and it took a more segmented approach to marketing its console than Sega did with the Mega Drive. Do you think this aided in Sega’s success? Nick Alexander: The video game boom was a global phenomenon and whilst European territories differed, the only one that did so substantial was Germany, where their youth protection laws meant that some of our best games were effectively banned. Germany was the only European territory where we were not market leaders. Nintendo’s family image was more appropriate for this market. Nintendo changed their sales and marketing organisations several times during this period and especially so in the UK. I am sure that this was helpful to us. Sega-16: What kind of things did you take into account for localization of American or Japanese games? Some European gamers complain that many quality American titles never made it across the Atlantic (to be fair, many quality PAL games never came to America either). Nick Alexander: We did not feel under particular pressure to localise, other than our packaging of course. There was plenty of good quality product available both directly from us and from our affiliated third party publishers. Sega-16: Former SOA president Tom Kalinske told us about the internal competition between the American and Japanese branches of the company, and how there was a certain level of resentment by Japan over America’s success. What was your relationship with Japan like? How involved were they in the decision-making process? Nick Alexander: The relationship between Sega Europe (SOE) and SOJ was complex and at times very challenging. The best example would be the Game Gear. Japan was very keen to achieve bigger numbers for this system. However, we had a negative gross margin from memory of -11%. Every one that we sold we lost more money. In order to sell more than originally planned we would have to reduce the price, increase the marketing, or increase the value of packs. All of these would increase our loss per unit even further. I had a long debate with Japan about this which culminated in the instruction to sell more units but not increase the losses. Clearly impossible if Japan would not reduce its price to us, which it would not. It was at this point that I decided to move on. Sega-16: Was there ever any situation where the rivalry between the American and Japanese branches affected Europe specifically? Nick Alexander: Our skills were in marketing, sales and distribution, theirs were in product design and development. This was not always understood. This inevitably led to some disagreement and confusion. I suspect that we had similar issues to the ones that Tom Kalinske had to deal with at SOA. 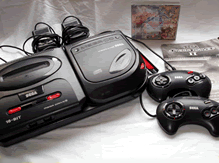 Sega-16: It’s been said that some countries, like Spain, were unable to obtain original model units of the Mega CD, which contributed to the add-on’s low sales in Europe. Is this true? How slow were the sales of the CD unit in Europe overall? Nick Alexander: The Mega CD was interesting but probably misconceived and was seen very much as the interim product it was. I am afraid I cannot recall the sales numbers, but it was not a success. Sega-16: Why did you leave Sega? Nick Alexander: I left for a variety of reasons, the main one being that I had come up with a very good and very successful idea for a new business which became Pearson New Entertainment, but I had also become increasingly frustrated and bewildered by differences in view with SOJ about strategy and marketing. We appreciate Mr. Alexander taking the time to chat with us.